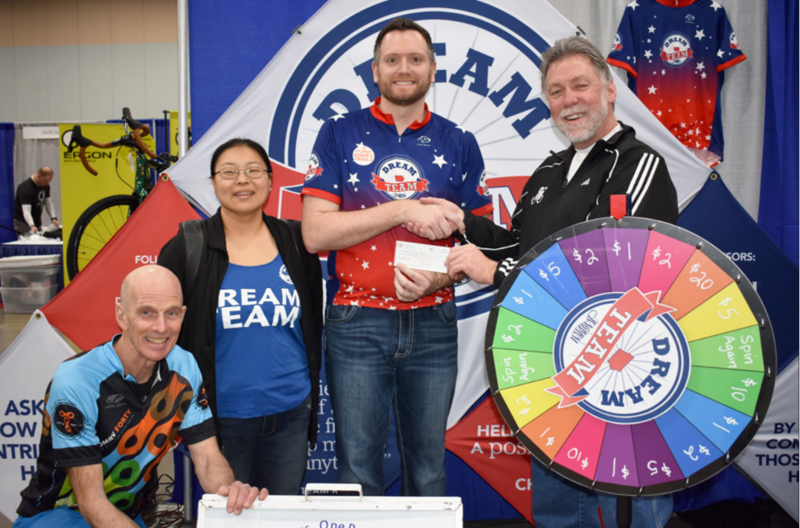 The QCBC Community Service program is a combination of monetary support for other cycling organizations (local, state, national), QCBC internal initiatives, plus varying degrees of QCBC expenses, volunteer involvement. Community Service is ever changing in order to accomplish the QCBC mission statement. It is mainly administered by the Committee Service sub-committee, but with overall Board involvement when needed. The Dream Team is a five-month program that partners youth with adult mentors to provide a unique opportunity to build relationships, achieve personal growth, and learn life skills. 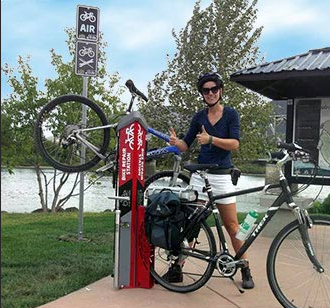 The program culminates with a weeklong bicycle ride across Iowa and the emotional experience of riding from the Missouri to the Mississippi River. The young adults in the program build confidence and self-esteem while learning that healthy goals can be attained with sufficient planning and preparation. QCBC Charter Services cyclist supplemented by the QCBC support this worthwhile program. The Quad City Veterans Outreach is a center focused on assisting and reaching out to serve those who have served us. These efforts focused on ways to better assist the local veteran’s population. The Veterans Outreach Center offers a comprehensive portfolio of supportive services designed to meet the needs of veterans and their families. Through the generosity of individuals and our community, all of these programs and services are provided free of charge. The QCBC has initiated two new bike safety programs. In cooperation with Ride Illinois and our local Illinois city and counties “3 Feet It’s The Law” signs are being posted on Illinois roads. In addition, beginning in 2019 “Share The Road” yard signs will be visible on both the Illinois and Iowa roadways. 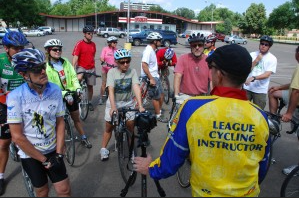 The second part of the clubs Bike Safety initiative is the club will be hosting the League of American Bicyclist League Cycling Instructor course in the Quad Cities. Once training is complete classes will be conducted for club members to improve their safe biking skills. Beginning in 2018 members if the QCBC could give children riding without a bike Helmet a coupon to purchase a bike helmet from one of Quad Cities bike shops. Once purchased the coupon and a copy of the bike helmet receipt is sent to QCBC Helmet Rebate, P.O. Box 3575 Davenport, Iowa 52808. A refund check for up to $25.00 will retuned to the cyclist. To participate in the program members should contact board member Terry Burke. 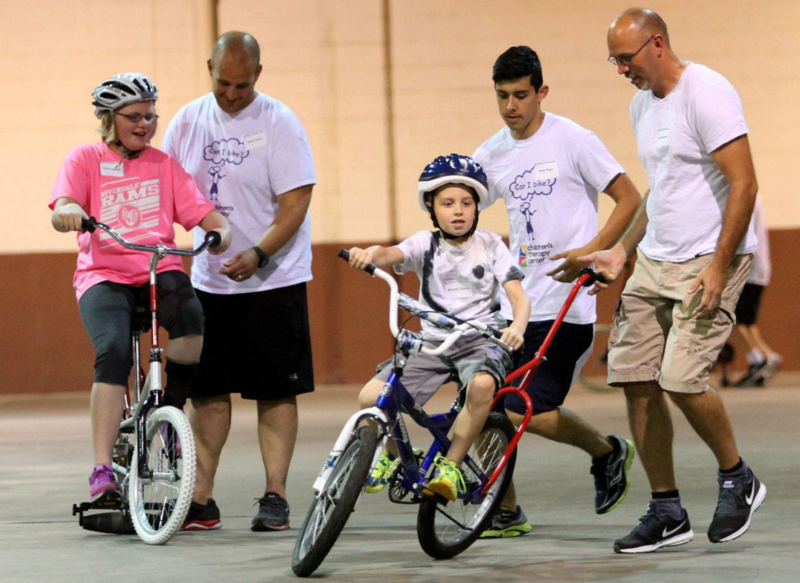 This one-week bike camp held at the Children’s Therapy Center program for kids with disabilities learn to ride two-wheel bikes that have been specially modified for each child. The goal of the program is to help kids learn to ride their special bikes. 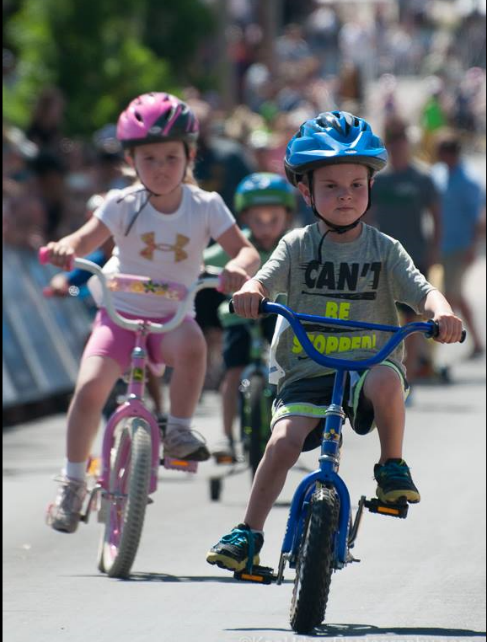 Eighty percent of the kids after the week are successful at riding their bike. The QCBC annually sponsors of a BMX race. Races are conducted at the East Moline BMX Speedway. 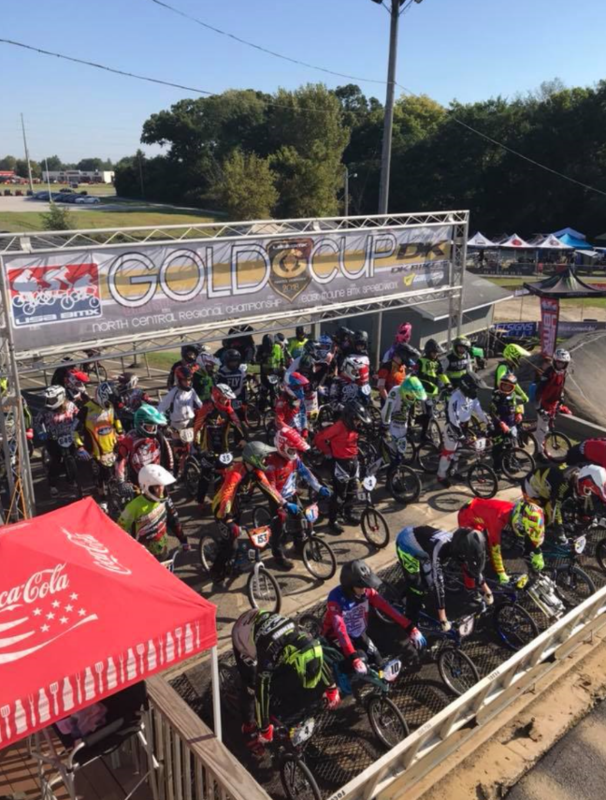 The non-profit bicycling program races at the East Moline BMX Speedway which is located at the Rock Island County Fairgrounds. Tour De Brew is a 40+ mile bike ride along the Mighty Mississippi river starting in Rock Island. The scenic bike ride boasts great views of the river and country side as cyclist traverse the bike path between Illinois and Iowa. There are multiple stops that have music, drink specials and fun activities. Tour de Brew QC supports CANCER programs in the Quad Cities. 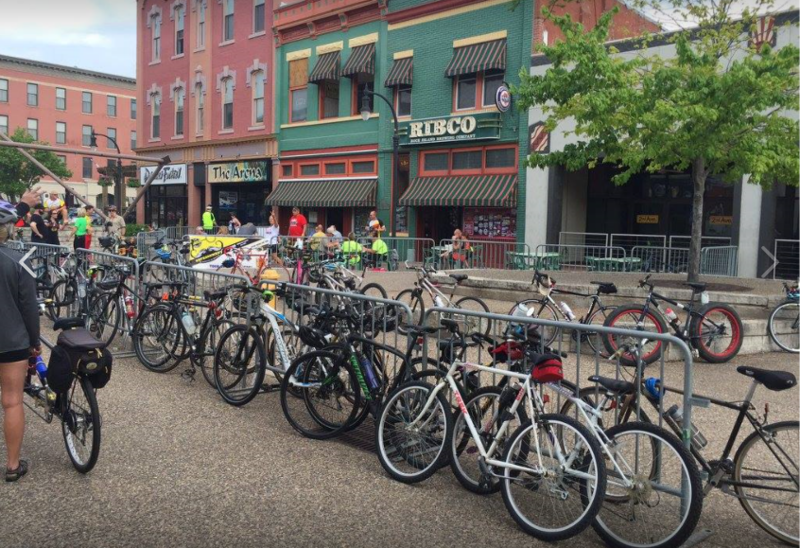 The Quad Cities Bike Club supports the program that attracts over 500 cyclists. River Actions Ride the River is an annual event that the Quad Cities Bike Club sponsors and club members volunteer time to for the fun family event. Held each Father’s Day hundreds of individuals and families take advantage of riding both sides of the Mississippi river. In past years QCBC has underwritten the cost of bike helmets for both youth and adults. At least twice per year QCBC members pick up trash along Scott Park road normally in the spring and fall. 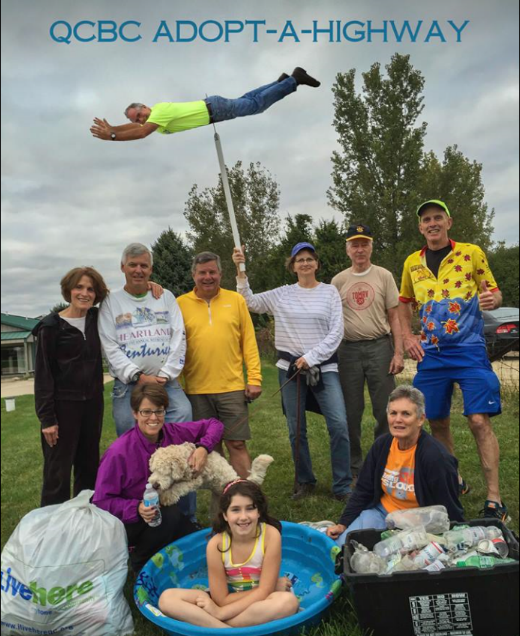 Members also do trash and vegetation clean-up along the bike paths on both sides of the Mississippi river. In 2018 the QCBC began a partnership with the Quad Cities Park & Recreation Departments to place Bike Repair Stands at the entrances of parks and key entry points on the trail system. This program will be a multiyear program that befits all cyclist. 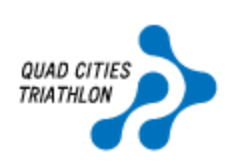 Held annually in June the Quad Cities Bike Club has been a sponsor for several years. The event is held at Scott County’s West Lake Park. Our club is active in advocating for bicycle safety at both the local, state and national level. Many of our club members activity participate in local advisory groups which promote safe cycling. Our club memberships in state and national organization help to keep legislators informed on issues that relate to cycling. As a club we encourage members to be part of the discussion. The League represents bicyclists in the movement to create safer roads, stronger communities and a bicycle-friendly America. 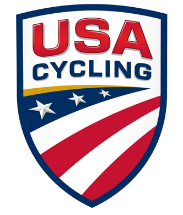 Mission is to develop the sport of cycling in the United States at all levels by bringing together cyclists, coaches, event promoters, community leaders, volunteers, and fans to form communities of those who want to see the sport prosper.